As 2017 gets into full swing, the goal of this post is to reflect on the impact of the Mozilla volunteer-run community spaces we have in Asia. These are the spaces in Jakarta, Manila, and Taipei. I’ll be presenting data and some analysis based on that. Yet data only tells some of the story. We’ll be also getting input from space stewards with insights on what worked and what didn’t ‘on the ground’ throughout the year. First, a reminder of what the community spaces program is all about. It is an initiative to open (or use existing) physical spaces for Mozillians around the world. It’s an experiment to create open spaces for people who are passionate about the open web, to collaborate with other communities, attract more talent into Mozilla, to strengthen local communities. The main hypothesis is that great things will happen. At Mozilla it was started by the WPR team in collaboration with the Community Building team in 2014, and in 2016 the Participation team took over the oversight of the project. Huge hat tip to William Quiviger who led the project until I took over in March. While it can be used for other purposes such as co-working, the main function of the space that we encourage is events. These can be presentations, workshops, hackathons, and so on. The goal is to promote knowledge sharing, learning, building relationships, and of course raising awareness of what Mozilla does from new and exciting technologies for the web platform going into Firefox to the issues campaigns we run to advocate for users and a better Internet. In Q2 we teamed up with the developer marketing team to make a targeted effort to have more events in the spaces for developers. The goal was not just to introduce that audience to the latest and greatest technologies coming out of Mozilla, but to talk about the best in Web tech in general. We provided general guidelines on topics to focus on, and tips on how to run effective events. Then we introduced mentors to space stewards, and then left enough room for the magic to happen. So let’s jump in and look at some numbers, with a reminder that these are not for the whole year but from April onwards. Another caveat is that Jakarta has a handicap of only starting events in mid-May, so 1.5 months less than other spaces. For reference, the full report is here. 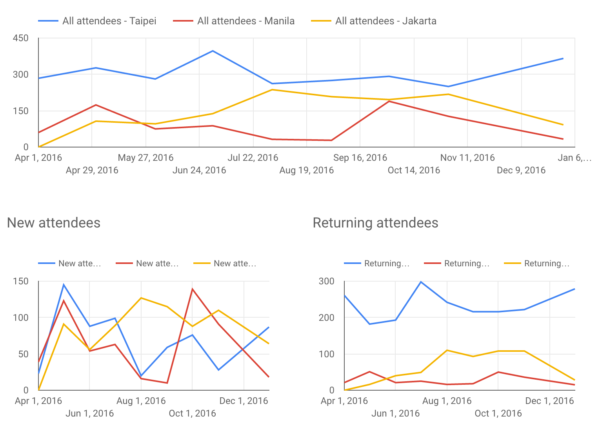 Thank you to Rizki Kelimutu for putting together this great report based on event data we logged since April. There were 351 events in total, which is almost 1.3 events a day in the collective. This averages out between the three spaces at 117 per space. That’s is a solid rhythm but as you can see the number is not evenly distributed. Taipei comes out on top, with 55.8% of all events. 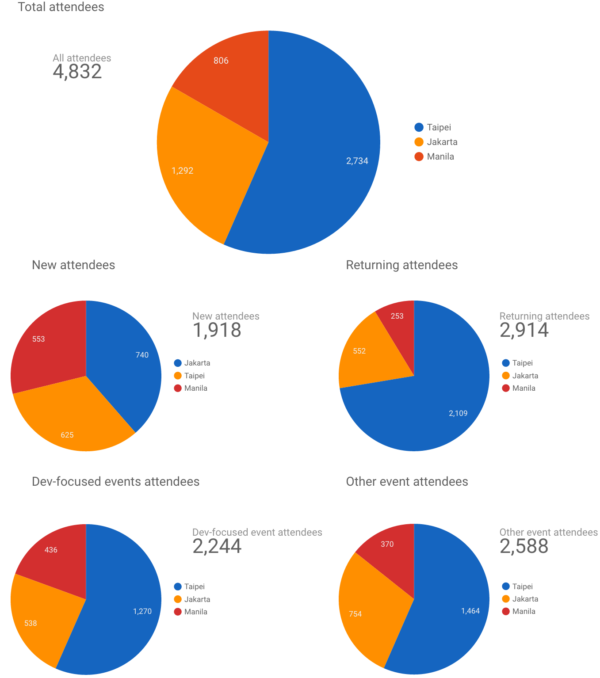 There is almost an split between developer focused events and other events 173 vs 178. 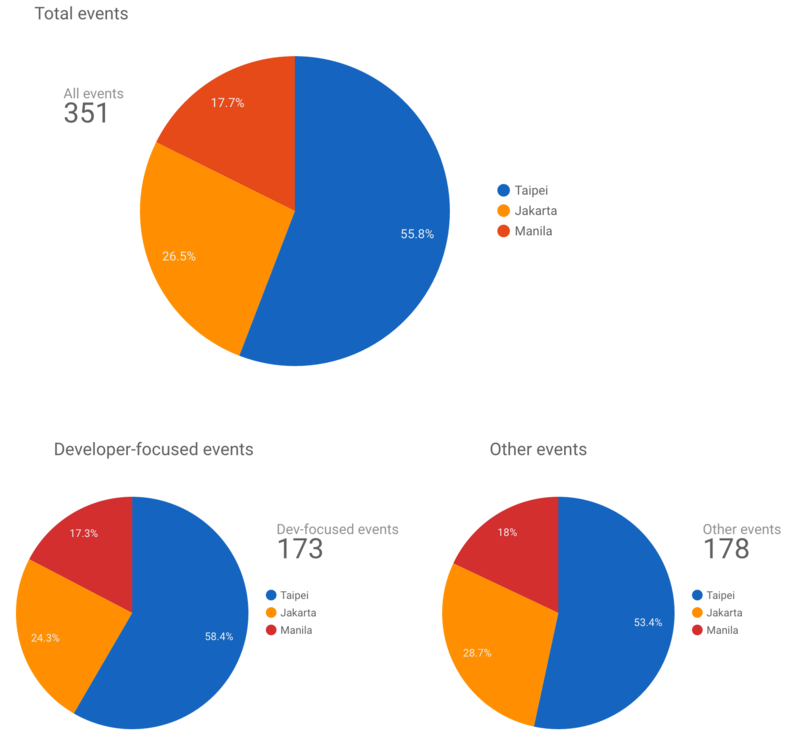 Looking at the breakdown of events between developer focused vs other types, per space they mirror the total however with Taipei a little stronger on developer events and Jakarta stronger on other events. Manila attracts significantly more new attendees. This could be for a number of reasons, such as a large local community, compelling new content, a wide variety of different topics covered, or increased awareness in 2016 of the Manila space. What is interesting here is the more frequent ups and downs in new attendees in all spaces, but take note that it is exaggerated by the smaller range (150) than returning (300). Attracting both new and returning visitors is a challenge. At its core however, it is about forming a strong sense of community, and ensuring strong and compelling content for people to learn and grow. In general for new vs returning, more detailed exit surveys would be needed to really find out the real story behind the data. Let’s see how the spaces shape up. One thing to keep in mind is that the capacity when comfortably accommodating people is around 30 people, with only Taipei able to fit in more safely by removing tables. So large events would need to happen elsewhere, e.g. there is a cafe below the Jakarta space that they can rent out for bigger events. So I would say that the main barometer for success in general is that the majority of events lie at the mid-size level. 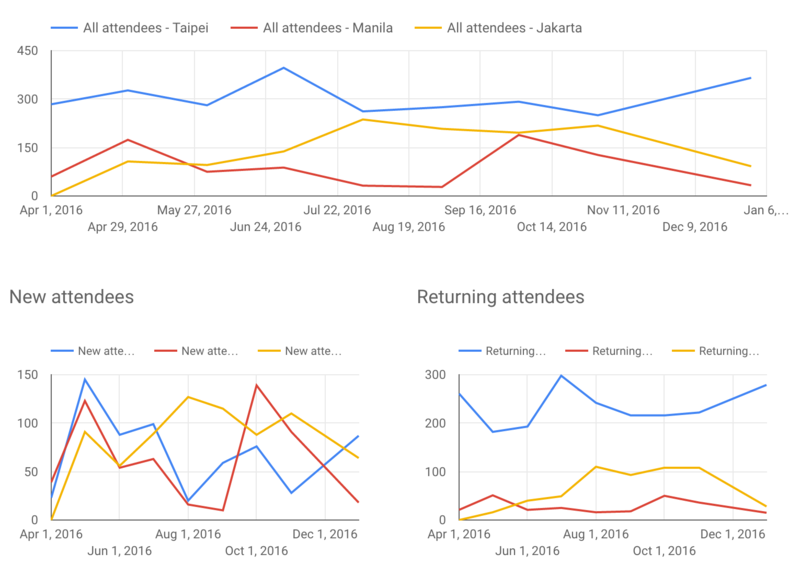 And that seems to be mostly the case in Jakarta and Taipei, with Manila fairing worse with events most months having <10 attendees. What trends do you see in the report, and what other conclusions would you make from the data? Leave comments on this post if you have anything. For me the highlight was visiting the three spaces in 2016. In January I went to Taipei to explore the idea of merging the staff space with the community space. While that didn’t happen this time, I did see up close the prolific and crucial work that volunteers do in the city and more broadly in Taiwan. In May I visited Jakarta and Manila. 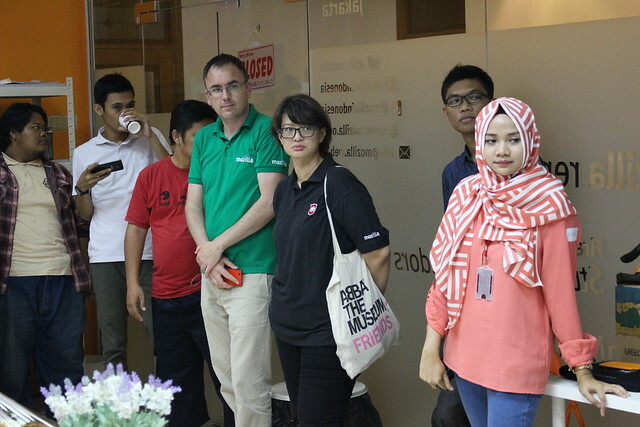 The purpose was to be present for the official Jakarta opening as well as: Check the status of the space in Manila, and visit other spaces in the city to see what the co-working/incubator/Maker Space scene is like; Talk to Mozillians in both communities to gauge community health; Monitor progress so far of, and provide guidance for, the developer engagement program; Get a feel for the wider tech scene in both cities to see where Mozilla sits and how we can spread our wings and make new relationships. Listening and watching at the Jakarta space opening. Picture by Yofie Setiawan. More photos. I came away with a fresh appreciation of the intense dedication that a core group of volunteers in the community have towards Mozilla, the impact they have, and more context on the vibrancy of the wider tech scene they are working in. Here are some more insights and highlights on 2016 from some of the space stewards. The Jakarta Space has been and continues to take part in campaigns for Mozilla. We are reaching the local Rust community, Developer community, and Web of Things. 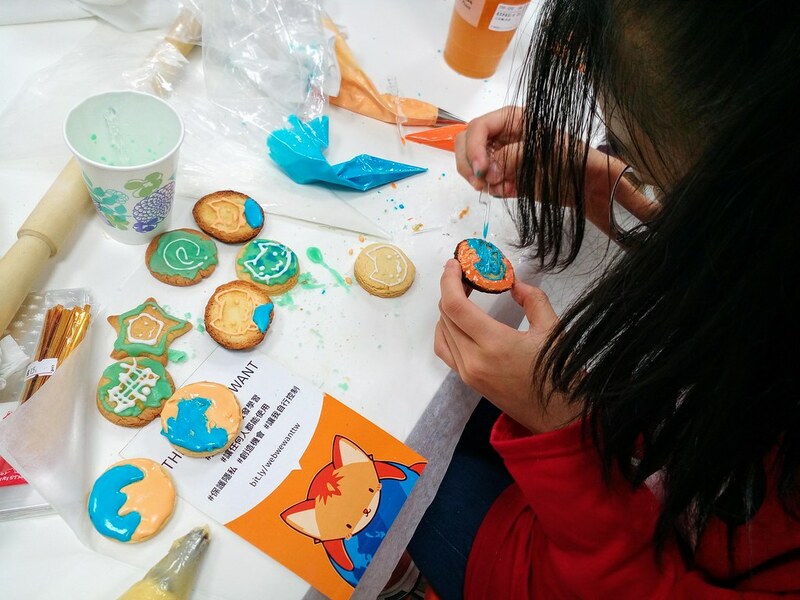 We took part in the Inter-Connected Community session at Mozilla Festival 2016, and we also support Mozilla’s marketing campaigns throughout the year. Our space is limited to maximum 25 people that can fit in the space. Already we have run many events that are really inspiring for many people. 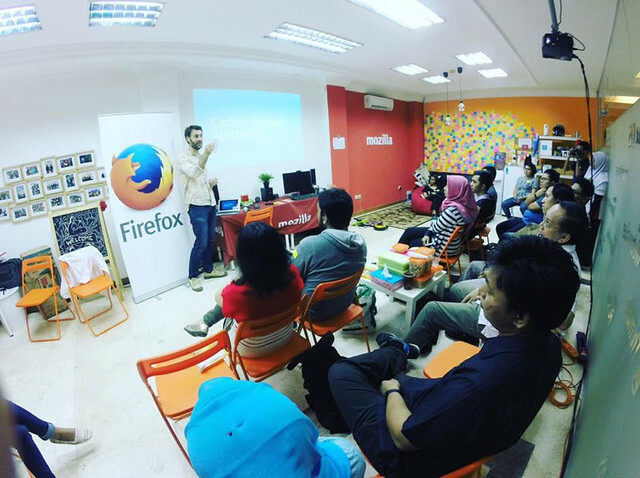 The Mozilla Community Space Jakarta Launch Party of course was the most crowded event, which happened on May 2016. We invited many inspiring speakers to share knowledge and do workshops at our space. 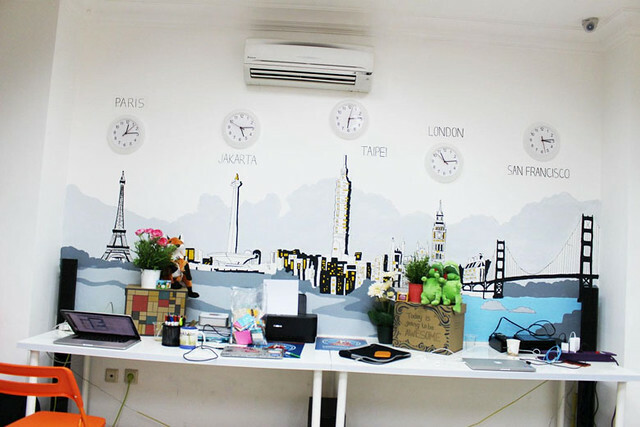 Our strengths include that we have a good location central in Jakarta, that is easy to access. We have strong relationships with many inspiring people and communities who love to share their knowledge and ideas through Mozilla Community Space. Our main challenge is managing human resources, especially keyholders who help as volunteers to taking care the space when there are events running. We continually adjust for efficiency, so everything will stay well managed. We would love to see more events, especially which also relate to the ideas, vision, and mission of Mozilla. 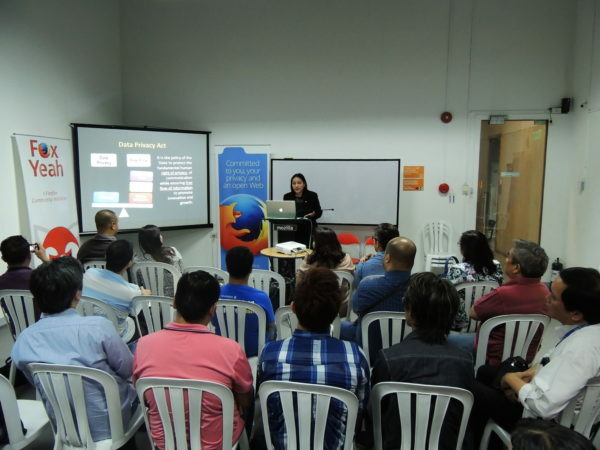 The year 2016 saw a couple of firsts for the Mozilla Community Space Manila (MozSpaceMNL). 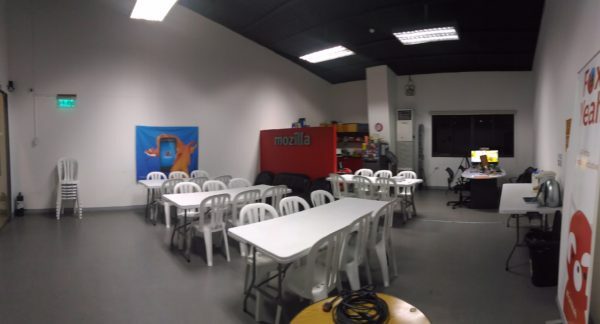 Launched in August of 2014, MozSpaceMNL in 2016 became the venue of choice for new or re-established developer communities around the metropolis. 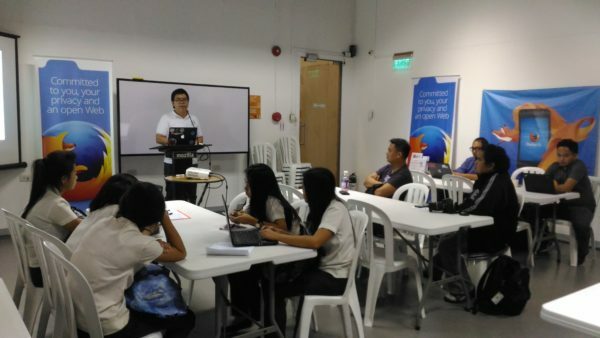 As for Mozilla Philippines Community’s part, we began conducting Introduction to Rust Programming Language events on a monthly basis. This led to the creation of a RustPH Group and the subsequent formation of a RustPH Mentors Group. Said group is now in the process of formulating a Standard Training Module for people in our locale interested in learning Rust as a second programming language. 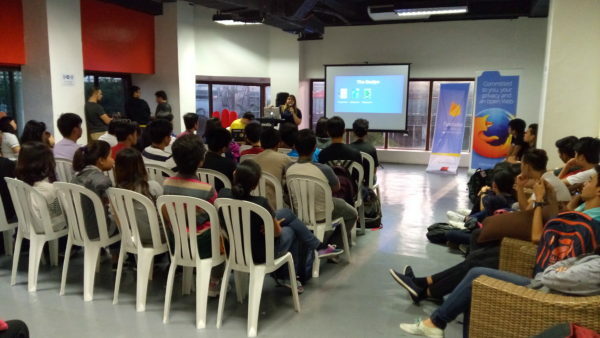 Also in 2016, a couple of events related to Privacy awareness were held at the Community Space in Manila. Noteworthy was the forum to discuss the Implementing Rules & Regulations (IRR) of the Philippine Data Privacy Act of 2012 with no less than the Deputy Commissioner of the Philippine Privacy Commission as our resource speaker. This event was followed by smaller weekend pocket sessions targeting on students to be aware of issues related with data and online privacy. 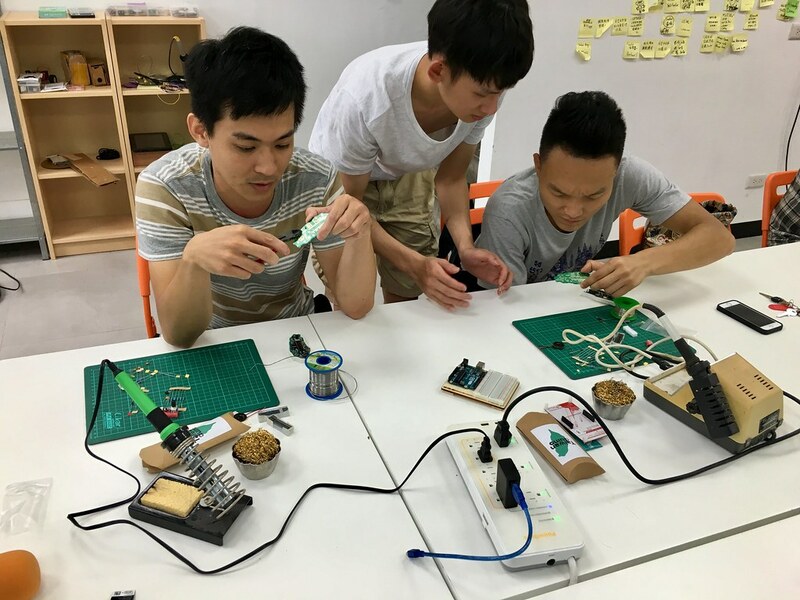 In October 2016, MozSpaceMNL participated in the very first Inter-Connected Community Spaces activity during the Maker Festival held in London, England. For 2017, we plan to continue with at least one Rust-related event per month. Co-organizing developer-related events with like-minded organizations will also continue. 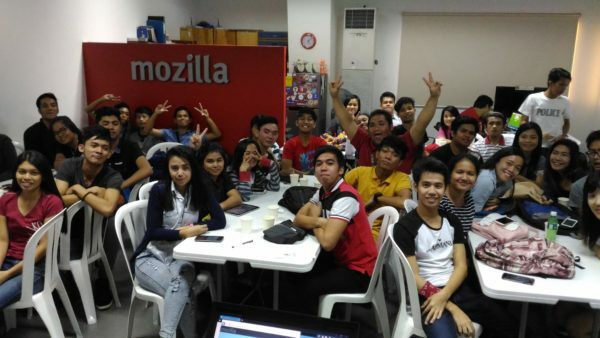 MozSpaceMNL’s support to other organizations by means of providing venue for their meetups and the like will still be there. We also hope for more inter-connected community spaces activities soon. 2016 is the third year of Mozilla Community Space Taipei. MozTW and more than 30 local open (source/culture/data/gov) communities together, we had host 320+ various events for 3300 people, and introduced Mozilla and our Mission to more than 600 first time visitors. 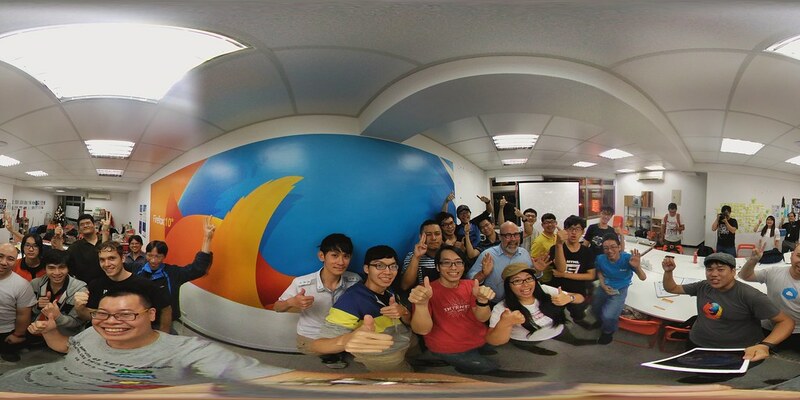 The best event in the space is “MozTW Lab” (as always), the local Mozillian’s weekly meetup. Volunteers gathering each Friday night to socialize, work, and give lightning talks on different topics including Mozilla’s latest update. This meetup had been running for 8 years, and in 2016 we had visitors from all over the world including Mark Surman, Brian King, Larissa Shapiro, William Quiviger, Max Ogden, Fa-ti Fan, 田爱娜 and many more. Another highlight of 2016 for the Taipei space is the diversity of the events, visitors and connected communities. There are growing types of the communities, dev-rel, open culture, open source and civil society community host events, workshops, meetups, talks, hackathons, and study groups. Different types of fun almost every night happened in Community Space Taipei. For dev-rel topics, Rust and WebVR workshops are the newest. But people also shared knowledge on JS / NodeJS, Python, Swift, React, Spark, OpenStack, C#, Clojure, Java, D3, Functional Programming, Android App… You can learn and meet community for almost every programming languages, popular or not. We also help by providing the venue for new dev communities such as “WizardAmigos CodeCamp” (local one). For open culture and non-dev technical events, Wikipedia and OpenStreetMap use Taipei Space for regular meetup, and there are workshops and meetups on Ubuntu, openSUSE, Fedora, R, Arduino, InfoSec, students and many more. There are also many gender based technical communities and events such as WoFOSS, R Ladies, Swift Girls and PyLadies. Larissa Shapiro’s visit in January reminded us of the importance to keep the space a place of diversity and inclusion for all. Have you ever build your own Arduino? One of the most special part of the Taipei space is the events and meetups from local civil societies, open government and open culture communities. Gov. hackers and programmers played an important role in democracy development recent years in Taiwan, and Taipei Community Space had become a base for popular open communities such as Open Culture Foundation and G0V. Our keyholders also actively support events about digital human rights or internet governance from Taiwan Association for Human Rights and Citizen Congress Watch. People came to making, hacking and watching not only the technology, but also the human rights, democracy and civil society in the community space. What do you want to share in Community Space Taipei? Let’s revisit our hypotheses and see how we fared. We can engage more with developers in the local communities that the spaces are in, to promote what’s new in Firefox and Web technologies in general. We teamed up with developer marketing, and had a total of 173 developer-focused events since April. This was everyone from beginners to experienced developers, on a host of technologies related to the Web. All three spaces have built up a network of all different technology companies and organisations. They engage at different levels, from working together on projects to sharing the space to have events. The Philippines community has in recent years been one of our largest and most dynamic, most notably in the area of student engagement. However, 2016 presented a number of challenges that decreased engagement. They have reached out for support from Mozilla and have a desire to bounce back. 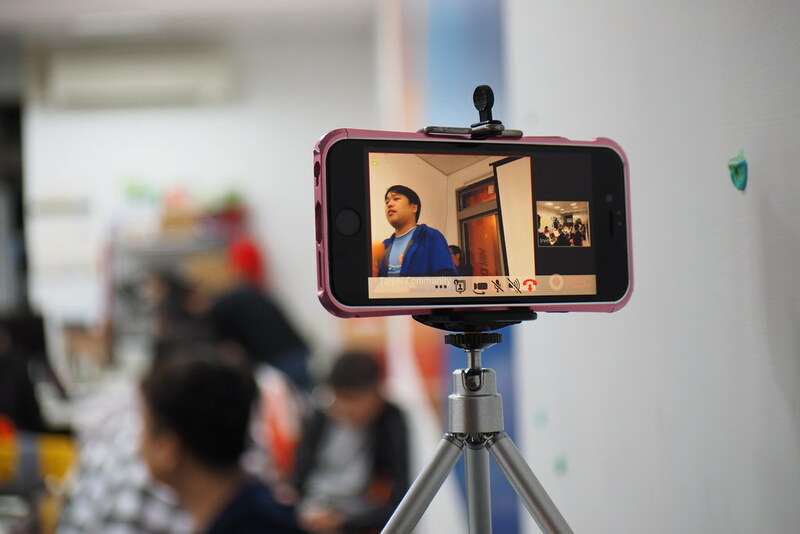 The communities in Taiwan and and Jakarta have a strong core, and while they have the classic growth challenges that all communities have, they have been trying new things and working in different ways to strengthen the broader open source movement. On balance, 2016 was a strong year for our community spaces. It has been shown that with the right support, and with alignment with community development and Mozilla goals, spaces can make an impact and raise Mozilla’s profile locally. Other communities around the world have been paying attention, and have requested support for the own spaces leading to an open question is how can we scale this model. Looking beyond, we can keep momentum going and identify areas for improvement. One thing I would like to see is teams at Mozilla working more directly with the spaces on programs that can help them achieve their goals. So far in conversations I’ve been having, Developer Relations, Developer Marketing, and Connected Devices are interested in doing this. And a broader question is how can the current spaces help with our broader Firefox product goals in Asia. Many thanks the community space stewards and keyholders who devote their free time to this. It is a great pleasure working with you, and I salute you for what you do! Phew! That’s a lot of stuff happening! Congratulations to all the hard-working volunteers who made 2016 a success in their spaces!